Ten years after “hands-free” driving became law, drivers are using their cell phones less often… but distracted driving remains a serious safety challenge. April is recognized as National Distracted Driving Awareness Month, and the first week in April is California Teen Safe Driving Week, making this an ideal time for safety advocates to focus their efforts on education and enforcement statewide. Traffic officers throughout the state have issued hundreds of thousands of citations over the past three years to drivers who were texting or making calls on a hand-held cell phone. Recent legislation made it illegal to use any smartphone apps while driving, further limiting drivers’ cell phone activity. Still, we all continue to see people driving dangerously while distracted by their phones. In 2007 (the last full year before the hands-free law went into effect), more than 33,000 drivers in California were involved in distracted driving collisions. Preliminary 2017 data shows that that number decreased to fewer than 22,000 collisions last year. If you need to read a text message, or need to send one, pull over and park your car in a safe location. (If you are on a freeway, please exit; do not pull over to the side of the freeway.) Once you are safely off the road, it is safe to text. If you have a passenger, consider making them your “designated texter”. Allow them to access your phone to respond to calls or messages. Cell phone use can be habit forming. Are you struggling to avoid the distraction? Consider putting your cell phone in the trunk or the back seat of your vehicle until you arrive at your final destination. 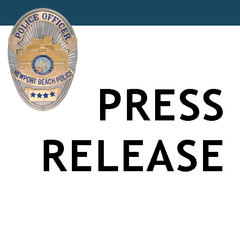 The Newport Beach Police Department is deploying extra officers with grant-funded resources throughout the month in city locations with higher numbers of traffic collisions. Violators will be stopped and cited, with fines set at $162 for first-time offenders. This campaign is funded by a grant from the California Officer of Traffic Safety, through the National Highway Traffic Safety Administration.